Leicester boss Claudio Ranieri has said his team must be tighter at the back to maintain their Premier League form. Despite an unbeaten start, the Foxes have not kept a clean sheet this season and have conceded the first goal in their last four league games. "It's not possible to continue in this way," Ranieri told BBC Radio Leicester. "I told my players it's very important to concentrate because we've started very well in every match, but suddenly we make a little mistake." He added: "I want the opponent to make a fantastic goal and you can say 'well done', but not when we help them to score a goal." 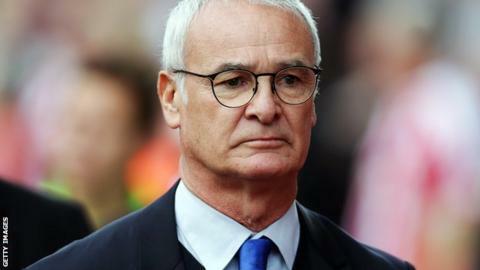 Former Chelsea boss Ranieri, who took over in July following Nigel Pearson's sacking, has led his side to three wins and three draws and fourth place in the early table. They face a tricky home game against Arsenal on Saturday, who sit two points behind in fifth. Meanwhile, midfielder Dean Hammond looks set for a loan move away from the King Power Stadium. The 32-year-old has made only one appearance for Leicester this season, in the 4-1 league cup win at Bury in August. "If he wants to go on loan, I think it's much better for him if he wants to play," Ranieri added. Hammond signed for Leicester on a free transfer from Brighton in 2013.